All its tracks were elided. Someone found it, once more within reach. ‘Tis the turtle that has the measure of the sea. For the ends of science across the bays. I obsess over thee, and for authorship will fight. The turtles no longer come ashore and nest. I watched them every night, and sometimes they watched me too. I counted them repeatedly under the starry skies. They watched me sometimes, and I watched them too. How could one have foreseen the eggs were all destined to die. Or which I cannot fathom because my text books fail me. (tugging, pulling, carrying) a little hatchling. The authors are biologists who believe poetry sounds better with a smattering of turtle-speak. 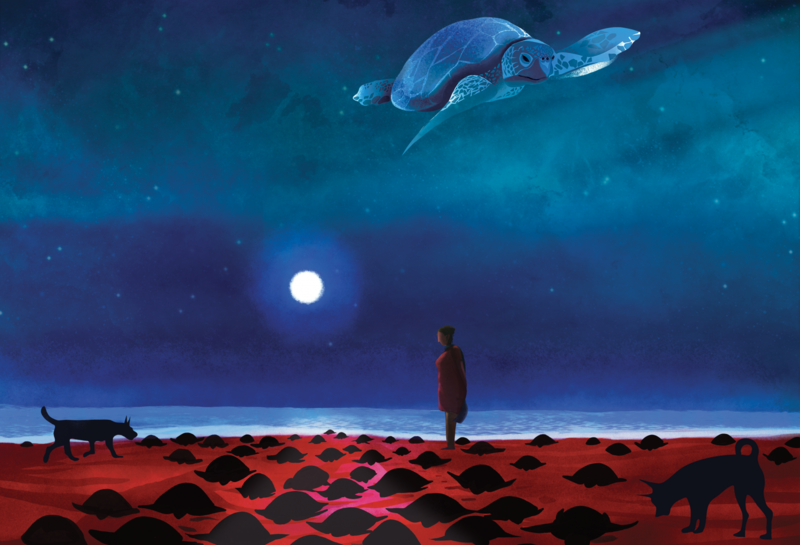 They would also like to thank the original poets for inspiration: Byron, Noyes, Eliot, Tennyson and Keats for ‘Turtle Song’ (Issue 11.2); Wordsworth, Frost, Longfellow, Cummings, Barrett Browning and Neruda for this poem. Vidyasagar Saple is a graphic designer and visual artist based in Mumbai. His dual life allows him to work with a variety of creativity fields and constantly explore different mediums.